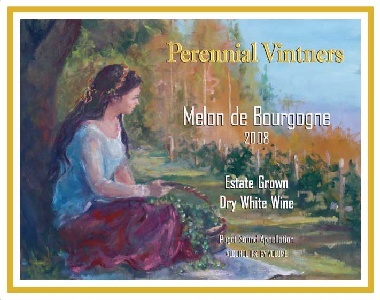 This is the first release of our Estate Melon de Bourgogne, vintage 2008! It is now available at the winery ($25.00). It will soon be available at local fine wine shops and at restaurants on Bainbridge and in Seattle (see Where to Find page for locations). In 2004, Perennial Vintners took a huge gamble by planting the first Melon de Bourgogne grape vineyard in WA state. We felt that the growing area of this grape in France (near Nantes) was sufficiently similar to the cool climate Puget Sound AVA that it would do well here. From the 2008 harvest we have finally released the first wine proving our gamble was worthwhile. We harvested about 1.5 tons and have produced 22 cases. 2008 was an unbelieveably difficult growing year in the Puget Sound area, thus we brought in the 2008 harvest with lower sugars, but physiological ripeness had been achieved with perfect pH and TA numbers and lovely citrusy flavors. It is a dry white wine, and is renowned across Europe (where it's known as Muscadet, pronounced moose-ka-day) as the wine for pairing with any seafoods. This wine was not intended to be aged -- please enjoy it young, while its fresh fruit aromatics are at their peak.